MANCHESTER, MA—July 27, 2015. MAC Tennis Academy had an unprecedented 34 tennis players competing in this year’s New England Junior Section Championships—including the Girls 16 Champion. The tournament, which was held at the University of Massachusetts in Amherst, MA, invites the top 32 players in New England from the 12-, 14-, 16- and 18-year-old age groups to compete for a championship. This year, the MAC Tennis Academy program, which is run out of Manchester Athletic Club, has trained one of the tournament’s champions as well as two finalists and three additional semifinalists. In the Girls 16s singles, the top spot was taken by Julia Newman of Natick, winner of the New England championship. Topsfield resident, Sasha Wood, bested almost everyone in her age group, making it to the finals of the Girls 14s event. Semifinalists included Ray Boppana of Boxborough who took 3rd place in the Boys 16s as well as Emily Parkerson of West Roxbury and Charles Shewalter of Winchester who each placed 4th in the Girls 12s and Boys 18s respectively. In the backdraw, MAC Tennis Academy players won both the Girls and Boys 14s with Brendan Jimenez of Lynn and Eleanor Schulson of Newburyport. Backdraw finalists included Bedford’s Ben Biswas in the Boys 18s and Winchester’s Sydney Weinberg in the Girls 16s who was also the recipient of the well-respected sportsmanship award. “This year we were represented at sectionals by more players than ever before,” said Todd Carpenter, Director of Tennis at Manchester Athletic Club. “It’s a testament to our growing program and a direct result of the commitment of our players, parents and coaches.” The academy is helmed by Director Francisco Montoya and Manager Celeste Frey. 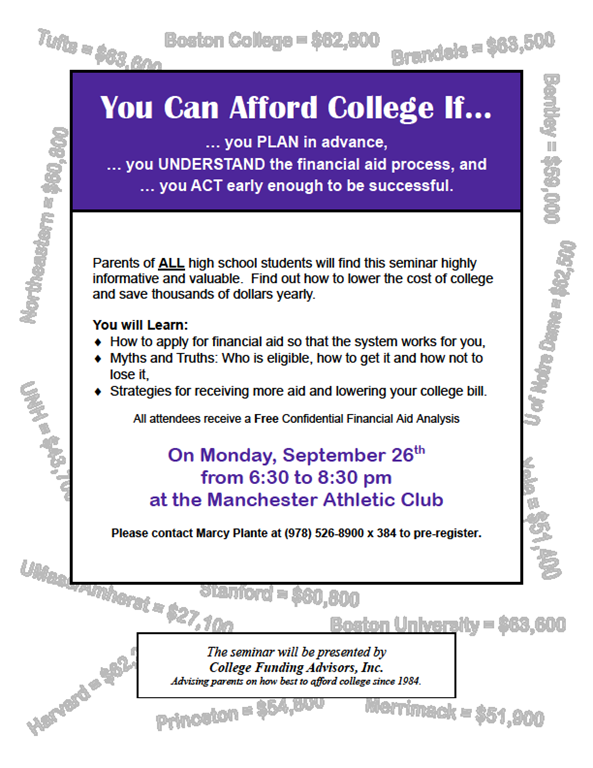 Manchester Athletic Club is a Regional Training Center of New England and one of 12 Certified Regional training centers in the country. It is home to MAC Tennis Academy, a tournament-training program for high-performance juniors, as well as a nationally-recognized 10-and-under program. 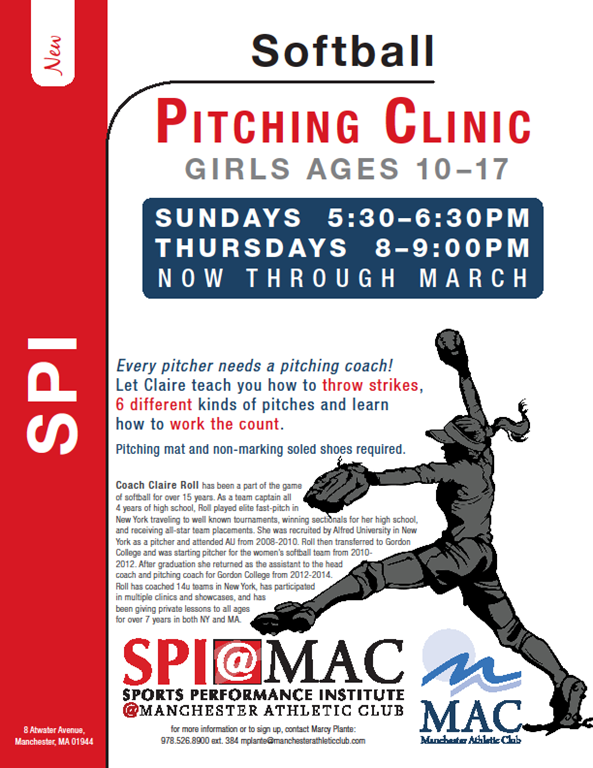 For information about our tennis programs please contact Todd Carpenter at tcarpenter@mactennis.com. Wind Down Wednesdays at MAC! Manchester Athletic Club is now featuring Wind Down Wednesdays. Bring your family over and enjoy a different event at the outdoor pool most Wednesday nights throughout the summer. This Wednesday (7/1)… Pizza Night from 5:00-7:00 PM! $6.00 per person for pizza, fun in our outdoor pool, specialty cocktails, beer and wine and a little R & R! 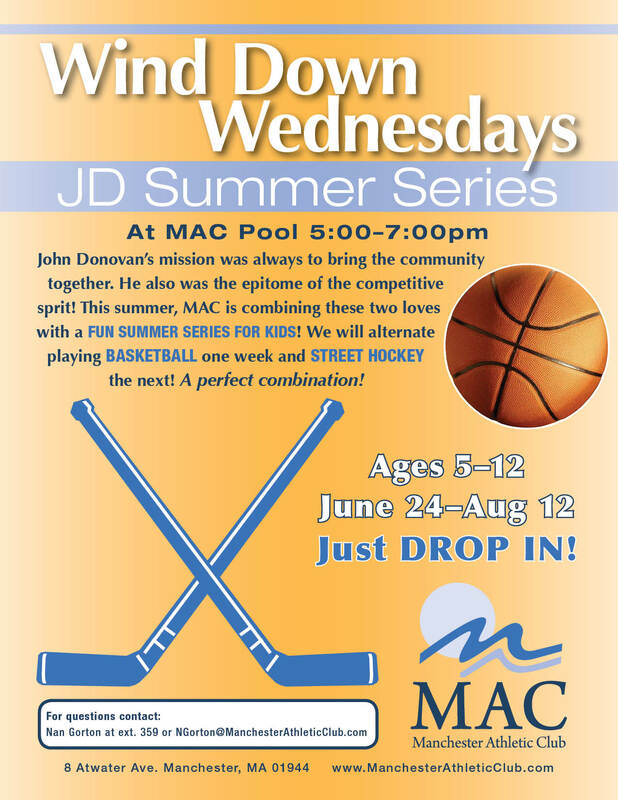 Enjoy our JD Summer Series and let the kids get their energy out before bed. Each week we alternate basketball and street Hockey- ages 5-12, completely free of charge and open to the community! 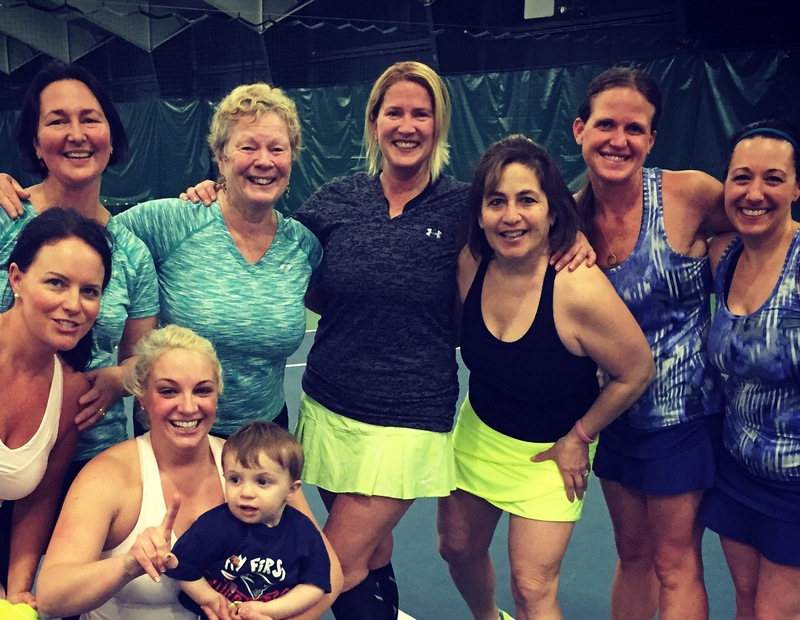 MANCHESTER, MA, May 21, 2015—Manchester Athletic Club’s Women’s B Level 1 Ladies are now championship winners, coming out on top in both their North Shore Women’s Tennis League standings as well as the post-season playoffs. The MAC women’s weekday team bested 11 other participating teams from clubs around the North Shore in a league that ran from September to April, culminating with the league playoff championships in May. The team was coached by Claudia Hawkes, Ayda Ardila of Beverly and Avis Murray of Gloucester and included players Jessica Weber and Emma Holland of Manchester by-the-Sea, Alina Franklin of Essex, Kasie Van Faasen of Wenham, Jessica Garten of Topsfield, Debra Bernfield of Beverly, Kristen Norton of West Newbury, and Dawn Dexter of South Hamilton. More than 20 teams from the MAC participate in the North Shore League at various levels of play, including women’s weekday and weekend teams, men’s teams and mixed doubles. This year, MAC Tennis had six teams finish in the top four in the standings for their level and advance to post season playoffs. MAC tennis teams are currently accepting new players for league play that begins in the fall. Interested players should contact Todd Carpenter, Director of Tennis, at tcarpenter@mactennis.com. 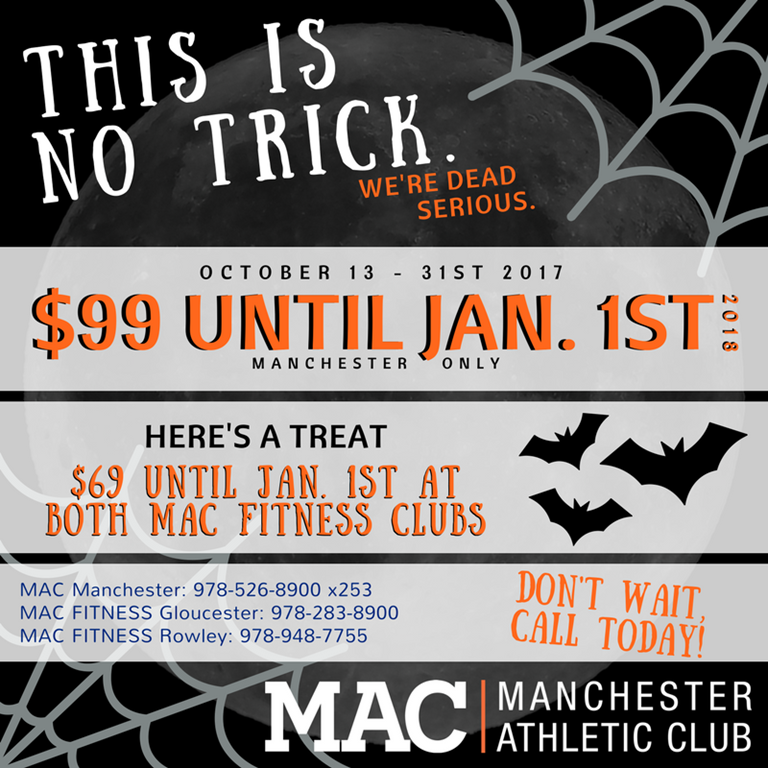 Manchester Athletic Club is a full-service health club and features 12 tennis courts, Gymazing! Childcare Center, iXl programs for young teens, a fitness and strength training center, indoor aquatics center, multiple group exercise studios, and an outdoor pool with playground. MAC is also home to New England’s professional tennis team, The Boston Lobsters.